All aquarium owners have looked at their tank at least one time and noticed a fish was missing. The happy ending to that story is that the fish was behind something and reappeared in short order. However, sometimes the fish is never found at all. In some cases, a body is never found either. Why do fish go missing sometimes, and how can a fish simply vanish into thin air? Any time a fish goes missing, it's important to try to find it and determine what happened. If fish continue to mysteriously disappear, the need to determine the cause is even more important. Some species of fish are not comfortable out in the open. They will hide a great deal of the time and can find some very creative out of the way spots. They will wedge themselves under rocks, behind decorations, within clumps of plants, even bury themselves under the surface of the substrate. So before you assume the missing fish has vanished for good, closely inspect everything in the tank. You might be surprised by where fish will hide. Even if you locate the missing fish, you may be wondering why they hide so much and what you can do about it. Fish hide for a variety of reasons, from being scared of their surroundings or other fish, to simply not being very social. Another reason a fish may be missing is that the fish jumped out of the tank. Even if the tank has a cover, if there are any openings, it's possible for the fish to jump out. Unfortunately, when a fish jumps, that usually spells doom. Unless you find them shortly after the escape, the fish will soon die and dry up. Any time you've noticed a fish is missing, the first thing to do is quickly examine the area around the tank to see if the fish jumped out. Check behind the tank, and inside the cabinet if the tank is on a stand. The distance from the tank that a fish can be found is surprisingly large, because the fish may wriggle around hoping to find its watery home. Surprisingly, some species of fish can survive for a period of time out of the water. Fish that have a labyrinth organ can survive for quite a while and may be saved if found in time. If you find a fish outside of the tank, and it is not dried up, return it to the tank. Watch the fish closely to see if it revives, and add some stress coat to the water to help replenish the slime coat that will have been damaged during its trip "outdoors". If the fish does revive, it will be more susceptible to disease for a period of time and should be watched closely for symptoms of illness. Also observe how the other fish interact with it, as it's not unusual for tank mates to pick on a weak fish. If necessary, move the weak fish to a quarantine tank, or put breeder net in the main tank to separate it from the other fish while it recuperates. 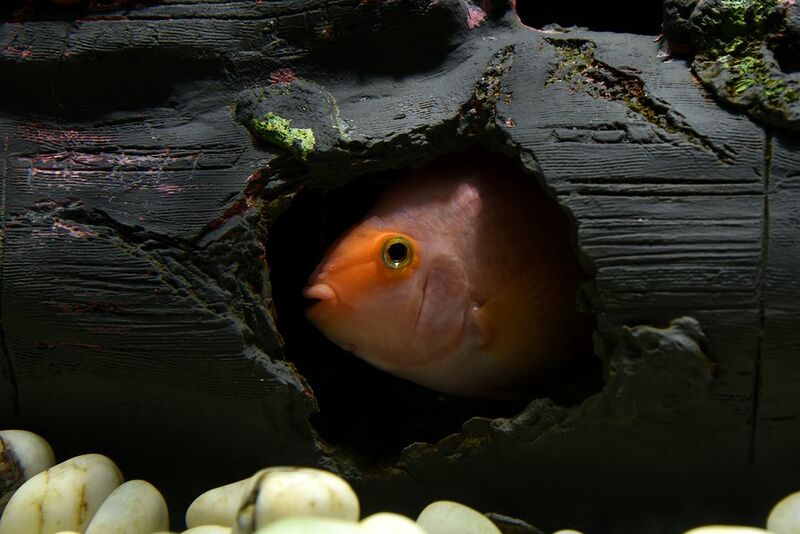 Fish that become sick or stressed will often hide. Finding a sick fish that is hiding may be the only chance you have of learning that it is sick and treating it before it dies. Sometimes sick fish become very weak and will be sucked into the filter intake, so make sure you inspect there if you are looking for a missing fish. In those cases, the prognosis is pretty grim, but it's better to find them before they die and pass on the disease to their tank mates who will probably eat them. Any time you find a sick fish, it is best to quarantine it in a separate tank to treat it. The reason for this is two-fold, first to keep them from being picked on by other fish, and secondly, so you can treat the disease they are suffering from. Obviously, dead fish don't swim. As soon as a fish dies, the other fish in the tank will begin feasting on their former friend. It's not personal; it's nature. Don't assume they murdered their former tank mate. They are just taking the opportunity to have a fresh meal. If the dead fish isn't found soon enough, the entire body may be consumed, leaving no trace of the missing fish. This is often the reason for a mysterious fish disappearance. If you are lucky, whatever caused the fish to die is not something that can be passed on to the other fish. However, any time a fish goes missing, it is wise to test the water for ammonia and nitrite to ensure something isn't amiss. There may be disease present, or another fish may have become a bully and is taking out his companions. Observe the other fish carefully on a daily basis for the next week or two, to verify that no other fish are showing signs of illness. Also, watch for signs of aggression. Just because a fish isn't aggressive to start with, doesn't mean they can't become that way later on. Changes in the makeup of the tank inhabitants, or even rearranging decor, can impact fish behavior. It's also possible the fish died of old age. No fish lives forever, and many fish have rather short lifespans. If you've had your fish for a number of years, some of them may be close to the end of their natural lifespan. Regardless of the reason for the death, dead fish should always be removed promptly. If one fish mysteriously disappears and is never found, it may not be a larger issue. However, if one fish disappears and is not found, followed by another and another, something is wrong. Serial fish disappearances can be caused by a number of factors. Water conditions are a top candidate to consider, as well as disease, and even a bully who is murdering his tank mates. Another possibility is that the fish are all old. If a group of similar species is purchased at the same time from the same shop, they may be similar in age. Eventually advancing age starts taking them, one by one. When faced with serial disappearances, test the water for ammonia, nitrite, and pH. Compare to previous tests to see if there is a pH drift or spike in ammonia or nitrite. Any of those changes can stress the fish and lead to disease and death. Look for any sign of disease, lack of appetite, unusual breathing and odd behavior in general. All may be signs of disease or stress that can ultimately leave fish more susceptible to disease. Monitor fish interaction closely to see if any fish are exhibiting aggression. If aggressive behavior is noted, move the aggressive fish to another tank or place a divider in the tank to separate him from the other fish. If the disappearances stop, you've found the culprit. Lastly, if you have serial disappearances, don't give in to the urge to immediately replace the lost fish. Until you know why the fish are disappearing, it's not wise to add more potential victims to the equation.